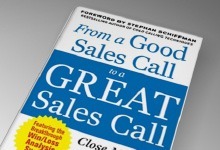 From a Good Sales Call to a Great Sales Call is a professional training book published in 2011 by Richard Schroder, founder and CEO of Anova Consulting Group. The author who is a well-recognized expert in the field with over a decade of experience and having managed hundreds of Win Loss projects highlights the benefits of Win Loss research and analysis as well as methods of implementing a Win Loss program. Part subject-matter overview and part “how to guide”, From a Good Sales Call to a Great Sales Call explains the benefits of gathering post-decision feedback from prospects and provides a playbook for increasing the accuracy and actionability of these debriefs. This book begins by educating readers broadly about Win Loss research. The purpose of a formal Win Loss analysis program is to gather competitive intelligence and aggregate feedback on a company’s products/services and sales process, which can be used to improve a sales team’s performance in future new business situations. Therefore, this book is intended for anyone who is involved in managing a sales team, who is responsible for running a business that oversees a sales force, or who is part of a senior management team that is involved with and impacted by a sales organization, including product, marketing and research managers. It is also intended for an entrepreneur, or anyone who sells as part of their job who wants to make a long-term commitment to their personal careers. A Win Loss program will assess strengths and weaknesses based on information available from the most qualified source available–the buyer. Win Loss research answers a common question: Why did you lose that sale? Learning the answer can mean the difference between landing and losing the next sale. From a Good Sales Call to a Great Sales Call is organized into eight steps that take the reader through the whole process of implementing and using a Win Loss Program. Throughout his career, Schroder has been involved in and managed hundreds of Win Loss analysis studies and shares compelling statistics to demonstrate the benefits of a Win Loss program. For example, based on Anova’s research, salespeople understand the complete and accurate reasons why they lose only 40% of the time. Another 28% of the time, salespeople have some of the story right but are missing other key factors that contribute to the loss, and the remaining 32% of the time, the sales reps are totally wrong in their assessments of why they lose deals. Furthermore, this data begs the question, if salespeople (or organizations or marketing managers or entrepreneurs) do not truly understand why they win and lose, how are they expected to improve their performance? Committing to a formal Win Loss program will help teams improve the effectiveness of their sales presentations and teams, determine key drivers for closing new business, uncover unmet prospect and customer needs, enhance competitive intelligence, and finally gather competitive intelligence. Step 2 helps the reader understand reasons why prospects are typically not candid in their feedback to salespeople once the deal has been won or lost. Primarily, prospects do not want to hurt the salesperson’s feelings and, therefore, are most likely uncomfortable giving critical and constructive feedback. Similarly, prospects may fear confrontation or may just be reluctant to share information on their chosen vendor. Having described these fundamental obstacles to acquiring feedback, Schroder proceeds to describe ways to address them through a Win Loss program. Similar to Step 2, Step 3 in From a Good Sales Call to a Great Sales Call addresses how the salesperson (or owner, entrepreneur, marketing manager, and the like) can inhibit the feedback process. Often time, salespeople “get in their own way” when debriefing with prospects. Salespeople are not in an objective position to obtain unbiased feedback. It is a tough spot to be in – that is, to try to gather feedback on yourself and your own process and performance without becoming defensive. While a salesperson may not know what to ask during the debrief or are even unprepared for the conversation, a formal Win Loss study will call for preparation, clarity, and specificity. This is good news: there is a way to overcome these barriers. Anova research shows that 93% of salespeople feel that post-decision debriefs through a Win Loss program are a valuable exercise that can help them win more business in the future. From a Good Sales Call to a Great Sales Call continues the lesson by introducing the how-to of designing a prospect debrief questionnaire – the key instrument to be used in any Win Loss research program. Learning how to design a solid, structured interview guide will help the user conduct better post-decision debriefs while at the same time helping them really own the conversations with their buyers and decision makers. Schroder shares that only 25% of people use a formal written questionnaire when conducting Win Loss research, a percentage that is far too low for consistent success. Being unprepared and disorganized during the conversation hinders the conversation’s flow and the ability to probe with follow-up questions to answers shared. Learning how to design a proper interview questionnaire includes learning key areas of interest and feedback, strengths and weaknesses, and finally benchmarking or quantitative scoring. Step 4 in the book also provides detailed examples of proven Win Loss debrief questions. With a proper debrief questionnaire prepared and in-hand, learning how to actually conduct the conversation is a natural next step in learning the fundamentals of a Win Loss program. Divided into three unique sections, this step in the process teaches the reader how to set up the debrief call, how to act during a post-decision debrief call, and how to probe and gather the most valuable information using proven interview techniques. Schroder encourages the reader to get approval for the conversation during the sales process as the final stage of that engagement; setting up a time after the final decision has been made is key. Once in the conversation, techniques such as letting the prospect talk, listening, taking notes, and asking probing questions help the person conducting the debrief put the decision maker at ease and allow for the unvarnished truth to come out. In addition, ideas about having someone neutral to the sales process conduct the call or even a third party are introduced as other options available in a Win Loss program. Going back to the fundamentals of a successful Win Loss program, it is imperative and powerful to analyze or “roll up” your Win Loss data. This is where the learning happens and the trends emerge. Step 6 in From a Good Sales Call to a Great Sales Call teaches a three-step process for analyzing prospect feedback so that the reader can act on identified trends pertaining to the sales performance, the company’s product and services, and the things the competition are doing to successfully compete. Further in the chapter, Schroder encourages discussing the findings and feedback with other personnel and management. Important steps include conducting enough Win Loss interviews for workable sample, analyzing the results in aggregate in order to identify strengths and weaknesses at a high level, and creating a two-page dashboard of specific strengths and weaknesses. A powerful tool of any Win Loss program is benchmarking your feedback against the marketplace. In this ending chapter, Schroder provides proven sales techniques based on nearly two decades of Win Loss research, techniques that will help anyone overcome sales pitfalls and ultimately close more business. By exploring key salesmanship issues in detail, readers can learn from losing behaviors while turning them into winning behaviors. This step includes insights into salesmanship issues such as understanding the prospects unique needs, treating prospects as valued customers, and cultural fit with organizations. Knowing these common salesmanship pitfalls will help the reader look for red flags in their own conversations and build confidence to face the constructive feedback in order to learn and better prepare for upcoming sales engagements. Concluding From a Good Sales Call to a Great Sales Call is a chapter which shows the reader how to take action on the feedback gathered during a Win Loss research program. Schroder discusses tested sales techniques that will increase one’s close rate. Saving this sales training advice for the last chapter is deliberate; as the steps in this book build on one another, this final chapter pulls it all together to encourage the salesperson or reader to improve their salesmanship. With advice on knowing the buyer and selling to the decision maker all the way to being prepared for every single sales engagement, Schroder lays out concise and motivational steps to improving a salesperson’s own sales steps. One of the most powerful sections of the chapter encourages the reader to become an expert in their own field – to be in the know 100% of what is being sold and passionate about that product or service. Salespeople must keep learning to be better in their role and to build rapport with prospects and buyers. This learning happens through product and service knowledge, industry knowledge and competitive knowledge, and should be a commitment made by each salesperson and sales team. Implementing the steps described in From a Good Sales Call to a Great Sales Call will improve sales performance. The book is designed to help salespeople, sales teams, managers, and entrepreneurs learn how to implement a Win Loss program and learn how to improve close rates. By developing a system that will allow the reader to make incremental changes along the way, they can constantly be improving skills as sales professionals and managers. A successful Win Loss program impacts many levels within an organization and can become a cornerstone key to any organization’s sales success.